TAG Blog: Animation on Paper? Till John signs off? I didn't think he was the director on this. How does everyone feel about him there? What do the storyboard artist think of the story? What's the atmoshere like now compared to a couple years ago. Today being the 2nd anniversary of Pixar taking over Disney animation and all. Speaking of the take-over,Valleywag.com has an interesting article on Steve Jobs and the buyout. Animated films are best written by fewer people not more. Think Bill Peet and Brad Bird for example. Are they writers or story artists? And, does it matter what they're called? Regarding the Valleywag article, both studios are guilty of employees doing way too much overtime. The bad results of this practice could easily be predicted. Tough as he was, Walt Disney still restricted the number of hours employees could work. Burning out your staff is ultimately bad business, and the Old Man knew that. Nice to see pencil and paper back at Disney. Very interesting Steve!!! Thank you very much! I want only to ask you just a little thing about "Princess and the Frog": is it true that Prince Naveen is today a black Prince? I know that Disney is working on another 2D project... is it "The Snow Queen" or "Ramayana" or another movie not yet announced??? Thank you by advance, Steve! I believe that the leads in the picture are black. If there's something cooking, I don't know what it is. Snow Queen was a project in development a while ago, I don't think it's on the development slate any longer. Don't we already have a black guy called, "Prince?" hmmm...I did enjoy the Goofy short playing on front of "American Treasure II". It was a pleasant surprise, and it was hilarious. I thought it was funny. You don't know Floyd do you? "Animation desks. Pegboards. Hole-punched paper. But it's sweet seeing the old disciplines back in action." 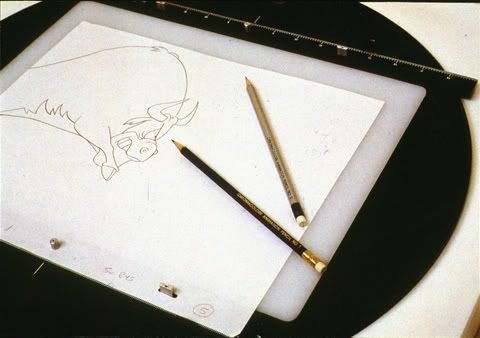 So, the thing with the Cintiqs and the ToonBoom Harmony digital 2D software didn't work out ? Floyd Norman said: "Don't we already have a black guy called, "Prince?" "
Now that was funny, Floyd! I don't care who ya are... that was a good one. Whoa doggies...that was a real knee slapper. What do you think about the male character (prince) is black and no white? I love the fact that the two whitest guys in animation are directing Disney's first film featuring Blacks since Song of the South. I'm not worried - I'm sure they'll nail Black culture as well as they nailed Arab culture. Nailing has nothing to do with it. "Aladdin" was a monster hit. That's what counts in Hollywood. "And Treasue Planet was Disney's biggest flop..."
Which is a shame because it's one of their most wonderful. The future generations will love "Treasure Planet". Yeah...and Bush will be remembered in the history books as a better president than Lincoln...and John and Ron are the most hip hop guys at the studio....roflmao...the first black main character is in good hands. Whether or not you think Ron and John are "the most hip hop guys in the studio" ...what does being "hip hop" have to do with directing a good movie? And do you mean to equate Black characters/Black culture = "hip hop" ? C'mon, the movie is set in 1920's Jazz-era New Orleans. Bush will be remembered in the history books as a better president than Lincoln...and John and Ron are the most hip hop guys at the studio....roflmao...the first black main character is in good hands.